I’ve been in construction all my life, and have pretty much done it all; from framing homes to complete finish work. Painting included. On one job I was painting a very yellow ceiling in a kitchen that was stained from many years of cooking and smoke. While cutting in around the ceiling light with a quick dry stain seal primer, I had placed the paint container on the stepladders shelf so I did not have to hold the paint bucket. As I was finishing, the customer walked in and I climbed down the ladder to have a conversation about what was going on in the world. After a couple of minutes of chit-chatter, I proceeded to pick up the stepladder to move to a new location and crashing down came the container of paint. There standing in the middle of the room laughing, was the customer covered in white paint on her, now polka dotted black pants. Thankfully, I had put down a drop cloth, but the paint splattered all over the kitchen cabinets. For the next 15 minutes I frantically ran around cleaning up her kitchen before the paint dried. It ended up costing me a new pair of pants, a trash barrel and some embarrassment for a couple of hours. That’s just one story. I can’t count how many times I’ve almost kicked over the paint bucket. There just has to be a better way of preventing these accidents. I started thinking about a paint bucket holder that you could fasten to your side. The problem was, who would put a paint bucket on their waist with wet paint dripping down the side of container? It would get all over you. That’s when I realized I would have to design a new paint bucket that would fit into a holder and not drip. After many shapes, flange angles and lengths, the Buddy System was born. 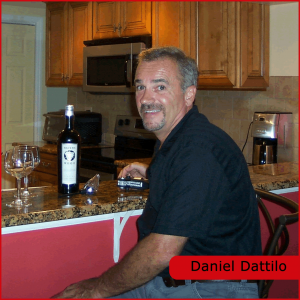 Dan Dattilo, President of Big Boy Ind. Proper Set-Up and Equipment Could Save Your Life.